← Thank you Offbeat Home! See this article featured at Offbeat Home. My name is Stephanie. I am a graphic designer in official capacity only when I’m employed. You see, I’m 25, and I am financially and habitationally dependent upon my parents. I am not only living once again in my parents’ house; I am living in my sister’s (former) bedroom. It’s a situation I’ve tried to make peace with since I graduated from college in 2008. When I moved back into this house, my sister’s bedroom was hers, and my bedroom was nonexistent. The room I needed to live in had decorated walls and shelves, furniture, clothes in the closet… I felt like it wasn’t my home, like it was temporary. And that worked for me until I began to realize how detached it feels to be living in someone else’s space and calling it your own. When I didn’t get a job right away, my assertion of independence was overshadowed by disappointment. My efforts to make the space seem impermanent backfired and made the permanence of my living situation less bearable. 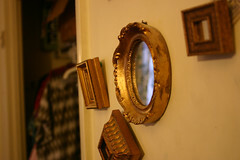 One of the first things I did to make my space more like home was to add personal touches, like hanging a small collection of gilded mirrors I bought at a flea market. It made the space seem more like my home and less like my sister’s. Gradually, I de-cluttered the room, slowly and carefully removing my sister’s possessions, asking her what she wanted done with them, and doing that. 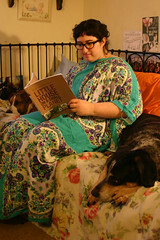 Small things, over time, eroded the room to reflect my personality and tastes more than my sister’s. Then I assessed my space. 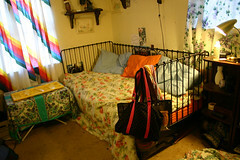 I wanted to be able to do everything necessary for daily life in my room. So I moved in some multi-purpose furniture, including a day bed, a folding table that can either be desk or coffee table height, and some folding camp chairs. This step made the space mine; I didn’t have to do my work in the kitchen, or try to relax in the living room while someone was watching tv. It helped the transition for me from apartment life, with all my spaces comfortably combined into a large bedroom, and communal spaces rarely occupied by roommates, to living with my parents, in my sister’s tiny bedroom. I had moved in originally with only necessary items. The rest of my things were kept in a storage facility, there being no room to put them in my sister’s space. 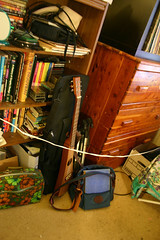 Then, they were moved and kept in storage space around the house. Up until recently, I didn’t have enough room in my bedroom to keep all the things I kept in my apartment in college. Moving in my books, records, and miscellaneous other personal possessions has made a huge difference in my comfort level. I feel more like I’m living in a communal house with my parents as roommates than an adult living with her parents. One of the most difficult things I’ve had to deal with as an adult living in my parents’ house is the condition of my home. I wrote an article for Offbeat Home in its beginnings entitled Ditch the magazine: Improving house-esteem. Truth is, I’ve always tried to lead other people in ways I can’t lead myself, because blazing a path altruistically is a lot easier than working up the courage to do something just for me. I’ve learned that sometimes the best practical solution isn’t the prettiest solution. 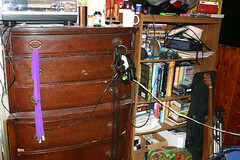 For example, my media setup hinges on a cable organizer clipped to a drawer handle that looks very dicey, but works (and moves easily if I need access to that drawer). And that applies to living situations too – it may not be glamorous to live with my parents, but I love spending more time with them, and I’m glad that I can live with them, because otherwise I’d be living on the street and I’m just not ready for that level of living the bohemian ideal right now. I think that being able to live comfortably with your parents as an adult hinges a lot on your mindset. I’ve tried to make outward changes, but really, the wealth of my growth in the past four years has been in my outlook, rather than in my room’s decor. Even though making your room a nice place to live is great, you have to be able to live in the house and the world outside of it and stay sane. That’s how I see it, anyway. Until I move, living with my parents is great, because it has to be, but mostly just because it is. To all you other adults living at home, good luck, hope this helps, and may the force be with you. P.S. For these and more pics, navigate here on the interwebs.